Though facts exist objectively, historical facts do not. The difference is constituted by the element of interpretation. While the world is made up of the entirety of facts, as Wittgenstein famously noted at the opening of his Tractatus, for these to weigh as significant events is a matter of choice. The selection is decided by historians who sieve through recorded and known facts and, according to the respective theoretical structures of the narrative they construe, assess their value accordingly and decide which facts appeal to their historical reconstruction and which do not. Much will be roped in; much, or even more, will be left unsung. 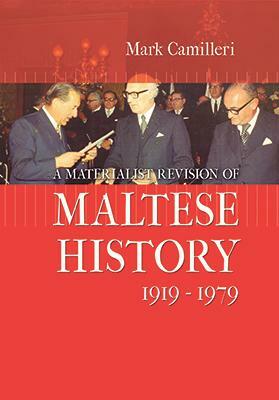 Mark Camilleri does as much in this second volume of his so-called materialist revision of Maltese history, covering the years 1919 through 1979. As the title suggests, his ability might be expected to be disclosed less in the documentary material he brings forth and more in the perspective he vows to give it. The story, according to his own reckoning, should be seen to take secondary place; it is rather the methodology which is promised to come out with force. The book does this to an extent. But for a terse paragraph here and there, its five chapters are all of a historical, rather than a technical, nature. Few direct ‘revisionist’ considerations are made. The story still seems to be perplexingly allotted the main stall. The concept of a ‘materialist revision’ certainly seems grand and refreshing; but is it delivered? A finicky reader might expect more beef on the purported objective of the book or, once the chips are down, of the whole ‘revisionist’ series (of which we now have two, apparently with a couple of others in the pipeline). He might be left to wonder, after all, how a materialist history should substantially appear to differ from a non-materialist one. If he insisted on being really exacting, he might even question whether, in this historiographical context, the term ‘materialist’ is being used to mean what a Marxist methodo­logy would usually make out of it. To explain his materialist model, Camilleri insists that his narrative has a bottom-to-top approach. This seems to imply at least two facets. First, that it provides a historical account from the perspective of the man in the street rather than that which concentrates on what people and/or institutions in power have done or failed to do. Secondly, perhaps less evident, that it focuses on the social relations which are determined by the degree and character of productive forces (tools, instruments, technology, land, raw materials, knowledge, and skills – aka means of production) in each particular period. Though Camilleri goes at length, backed with statistical data, to bring out the material conditions at various moments in the life of the Maltese people, inadvertently the pledged bottom-to-up approach seems to be recurrently passed over in favour of its alternate approach. So much so that, even according to the standards of Georgi Plakhanov, one of Camilleri’s various theoretical sources in this regard, he comes close to proceeding as an economic materialist would, this, dangerous enough for his cause, being a variety of idealism itself. So what, in the last analysis, ought a materialist conception of history be doing? It should be proving that, to paraphrase Marx’s words in A Contribution to the Critique of Political Economy (1859), “it is not the consciousness of men that determines their existence, but their social existence that determines their consciousness”. In other words, such a history should strictly desist from presenting the existence of some kind of battle of ideas and instead fix its analytical gaze on mutating relations between people and their means of production. Camilleri possibly gives his best shot at this. Most of the many historical facts he selects for his narrative come from a variety of primary sources (both locally and abroad, particularly in England), some of which perhaps had not been hitherto examined as closely. Though the main drift of the narrated story – basically Malta’s recent Constitutional history – would possibly not be entirely new to any keen reader of Maltese history, especially with Joseph Pirotta’s Fortress Colony at hand, Camilleri succeeds in presenting it as a socialist revolution, in the sense of seeing the (Labour Party) ‘masses’ – an admittedly ambiguous pet word of the author, often qualified as ‘working masses’ or ‘labouring masses’ – as making an effective presence into purposeful political engagement, thus bringing to an end a model of an exploitative society grounded on classes and the division of labour. One of the main misgivings with this rendering (palpably not the only one) is its somewhat Manichaean tincture. For the Labour masses on one side of the ideological spectrum seem to be eternally pitched against the British, the Church and the Nationalists on the other side (who never seem to gather themselves in ‘masses’, let alone working or labouring ones). Each side, moreover, seems to form a thoroughly cohesive grouping. All of this cannot but irk, to say the least, anyone remotely familiar with political configurations and complex social realities. Yet most, if not all, of the studies on the same subject, by local professional and non-professional historians alike, more or less bear the same conceptual disposition. Such categorisation, it seems, is too stubborn to shed. If anything, however, it is possibly the one most important area where a historiographical revision is needed. The goodies-vs-baddies world-view is more apt for Hollywood movies than for historical accounts worth their salt. Camilleri’s revision is not in this line. What he sets out to revise is the historical perspective generally adopted by locals when narrating their past. Such irreverence is not entirely misplaced. Possibly first attempted by Andrew Vella in the mid-1970s, the bottom-to-top narration of history, which acknowledges the collective historical role of the common people is not some socialist, or even leftist, prerogative. The approach, starting perhaps with Jesse Lemisch in the 1960s and subsequently backed by sound literature, makes historiographical sense. Good for Camilleri for promoting it, whether or not his revision passes muster. Mark Montebello is a Dominican scholar interested in Malta’s philosophical history, and the leading expert of the early-20th century social reformer Manuel Dimech.